I LOVE working with clients to create custom items for special days in their lives. 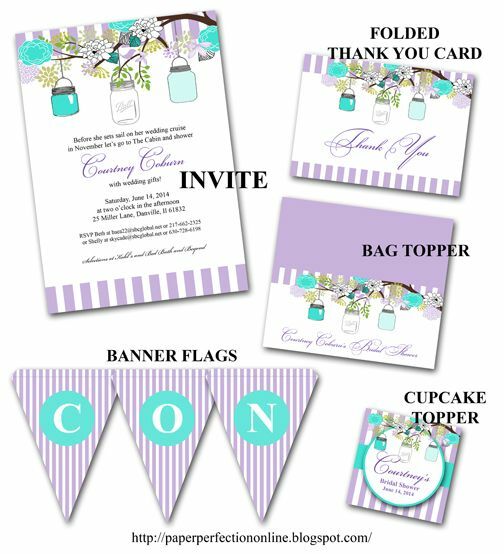 I was recently contacted by Shelly that had previously purchased my western collection and she wanted a few custom items for a bridal shower. She was hosting the party at a family favorite spot called "The Cabin" and wanted to decorate with mason jars and the bride's colors of turquoise and purple. So I took all of her ideas and these are the items that I created for Courtney's Bridal Shower. If you would like custom items for your next event contact Paper Perfection at jtanddolly@yahoo.com for pricing and details.